Although sign boards today are limited to advertisements, directions, and traffic control, they played a significant role during ancient times, when there were no street names or numbered houses, and when few people knew how to read. There were carved wood signs, custom wood signs, engraved signs, and painted signs. Signs were carved in wood and stone and then painted to add an artistic touch. Today, sign boards can be made of plastic, redwood, or any number of materials, and are used as roadside signs, entrance signs, restaurant signs, etc. Letter boards come in several styles and are a very practical way to display your advertisements, messages, and announcements. Letter boards are commonly used for bulletin boards, directories, lobby directories, and message signs. Letter boards are also effective tools for occasions where changeable signs are desired. 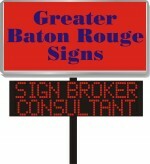 Greater Baton Rouge Signs offers you a wide variety of sign frame products that are sure to suit your requirements. The products include multi-panel frames, single frames, and quad-fold sign displays. Also, you take advantage of amazing discounts on these products. In advertising, signs are displayed through images or letters. Flashy, fancy letters are more attention-grabbing compared to simple letters. While determining the format and design of the display letters, Greater Baton Rouge Signs takes into consideration important factors, such as what the sign display face is and how effectively the message could be adjusted without disturbing the original context and visibility. We know that the purpose of advertising is to draw attention to the message and not the medium, and an effective letter sign has a good composition and possesses balance, unity, harmony, and rhythm altogether. Greater Baton Rouge Signs keeps a balance in deciding the font style and size, depending upon the intended purpose of the sign, whether to sell a product or display a message or service. We also consider if signs will be viewed by fast or slow-moving traffic.